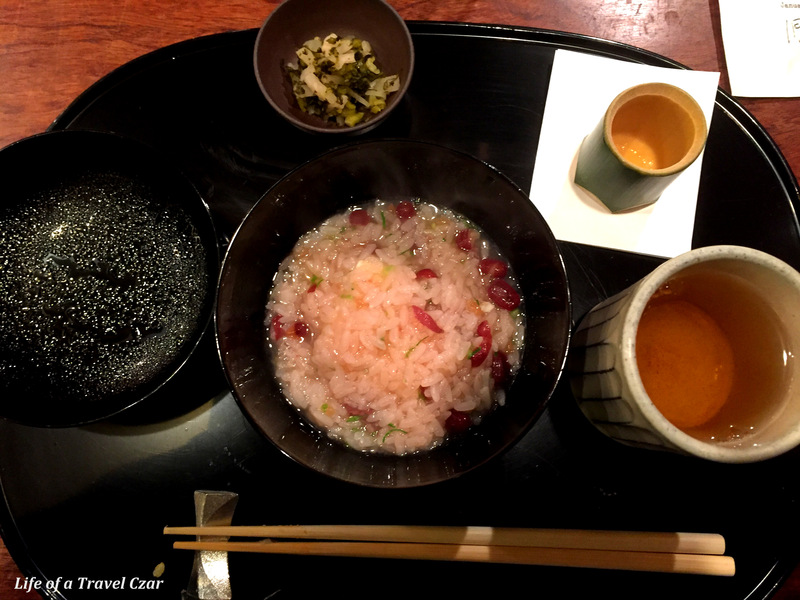 Now I have tried booking a number of good restaurants in Tokyo and it is difficult with the language barrier, booking from overseas and some restaurants just don’t allow solo dining. 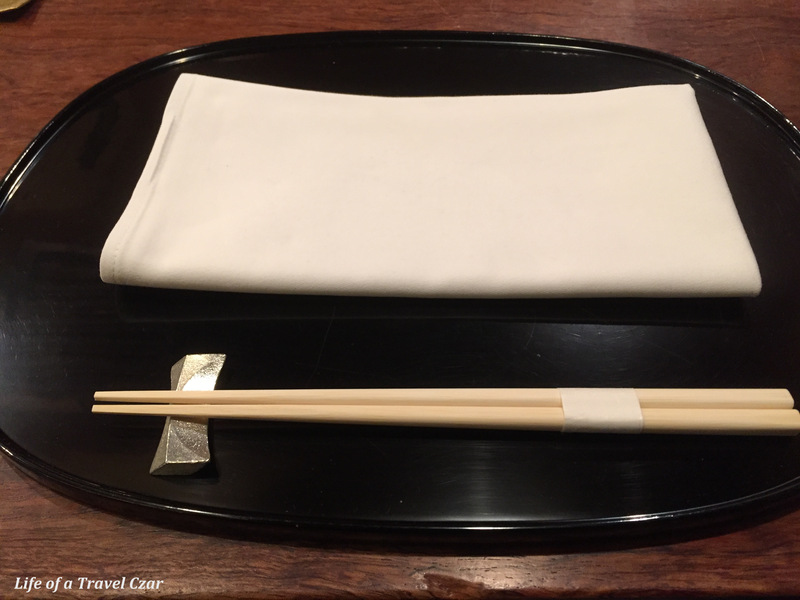 So I ended up having the concierge at my hotel (the Intercontinental Tokyo Bay – an amazing hotel, you check out my review here) to arrange a booking at a top quality restaurant of his choice… he chose Yukimura in Azabuan. 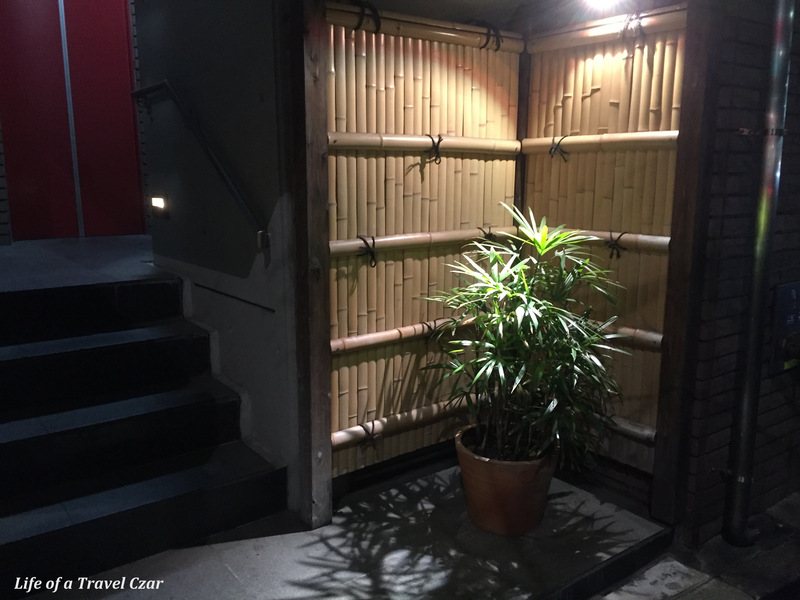 The restaurant is located in a small building in Azabu-Juban, however, there’s no sign displayed outside the shop – you’ll have to locate it using the block numbers in the address to find it. 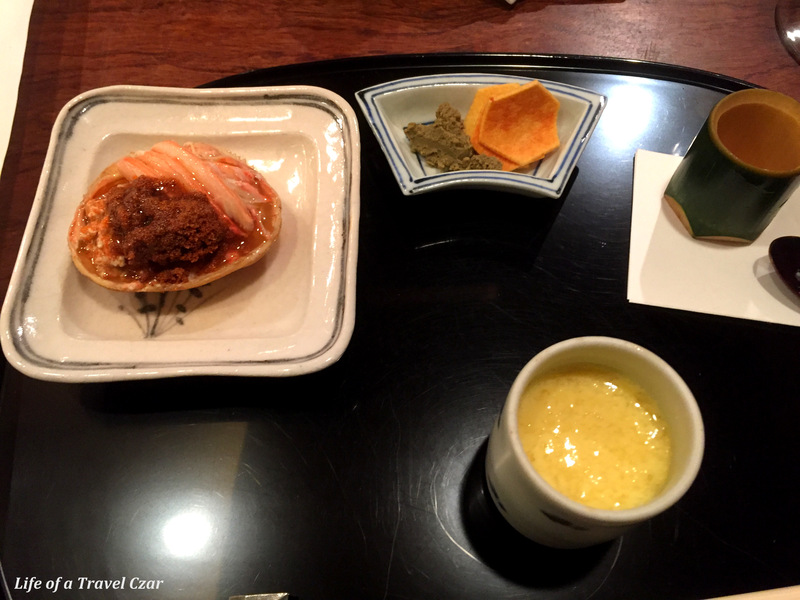 They offer a Kaiseki style menu with using ingredients especially ordered in from Kyoto with a focus on specialities from that region. With only a handful of counter seats (10) and one table (a four seater) you do need to book in advanced. 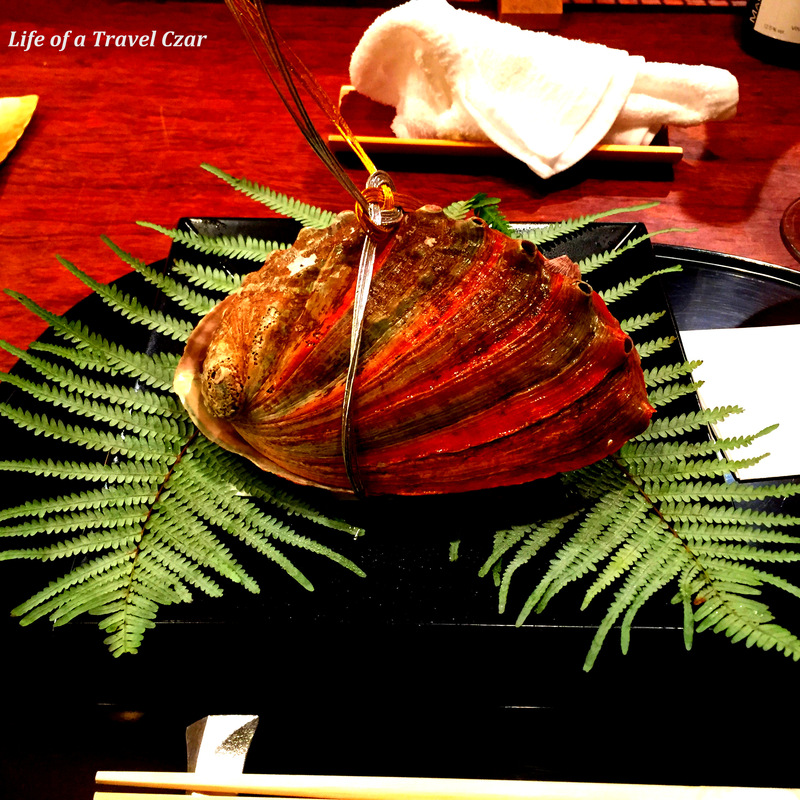 The restaurant has 3 Michelin Stars and is considered one the best in Japan. 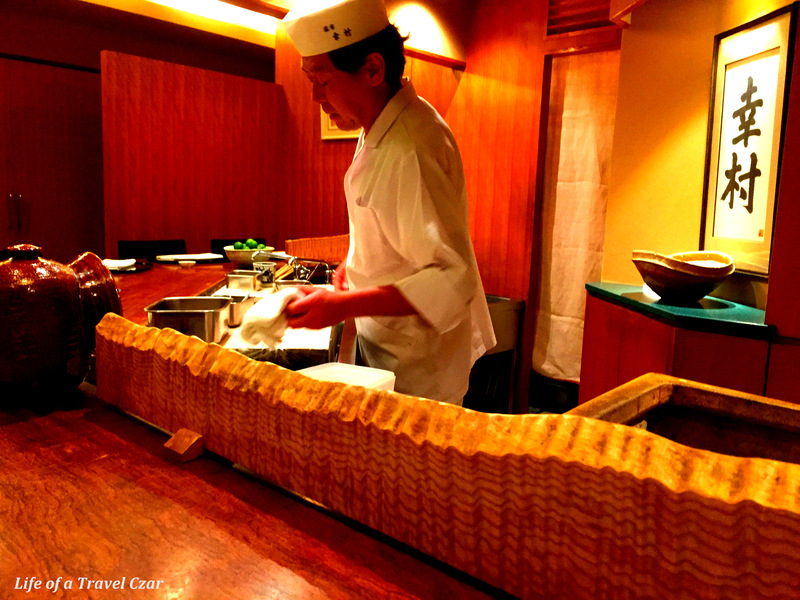 Its head chef Jun Yukimura needs no introduction, who learned his trade in Kyoto and was previously head chef at none other than Muromachi Wakuden. He retains a hands on role in preparing the food, clearing the plates and interacting with the diners. The wine menu literally has champagne, beer, white and red which isn’t helpful and doesn’t indicate much variety. 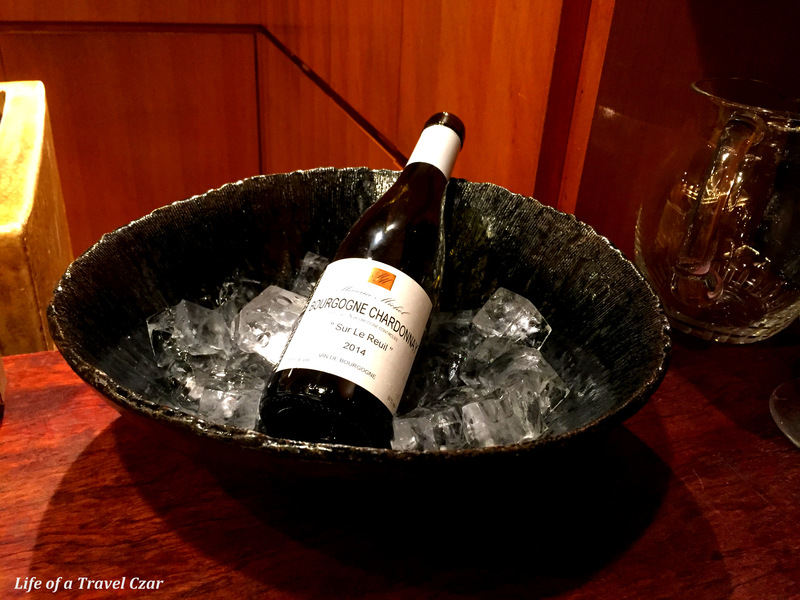 I try to ask several times and finally after the staff understand what I am after, they offer a selection of a few half bottle white wines. I settle one that seems to do the trick for the menu to be served. The aromas with nuances of citrus fruit, floral notes, hazelnuts and honey, the wine flows onto the palate with wonderful flavours of sweet apples, citrus peel and light touches of honey. There is sufficient acid for the seafood and a lovely buttery finish to match. 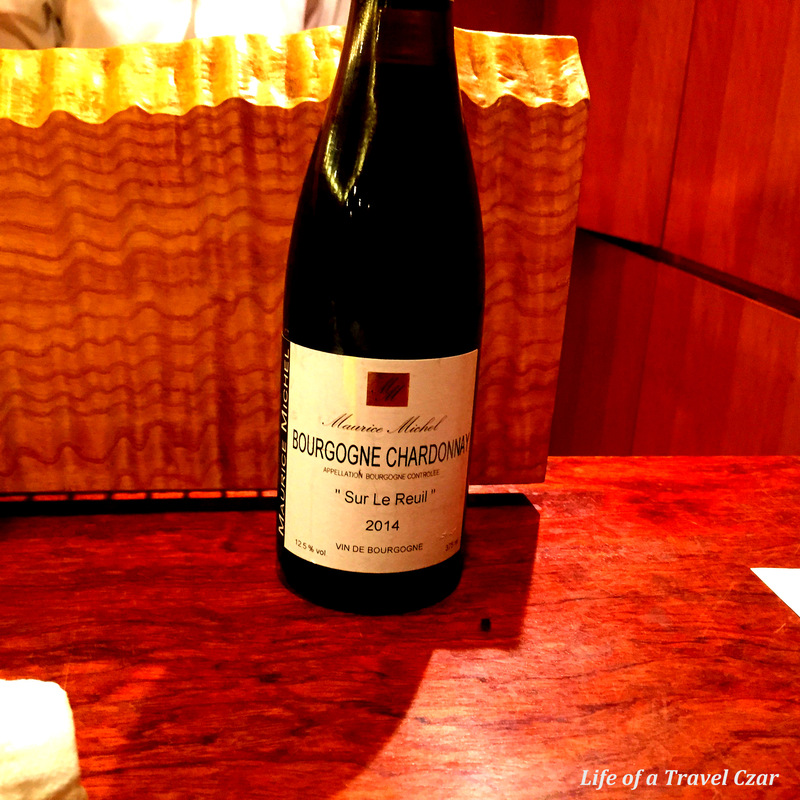 It is sufficient to pair with the dishes and proves to be a nice companion for the evening. The dish is exciting. 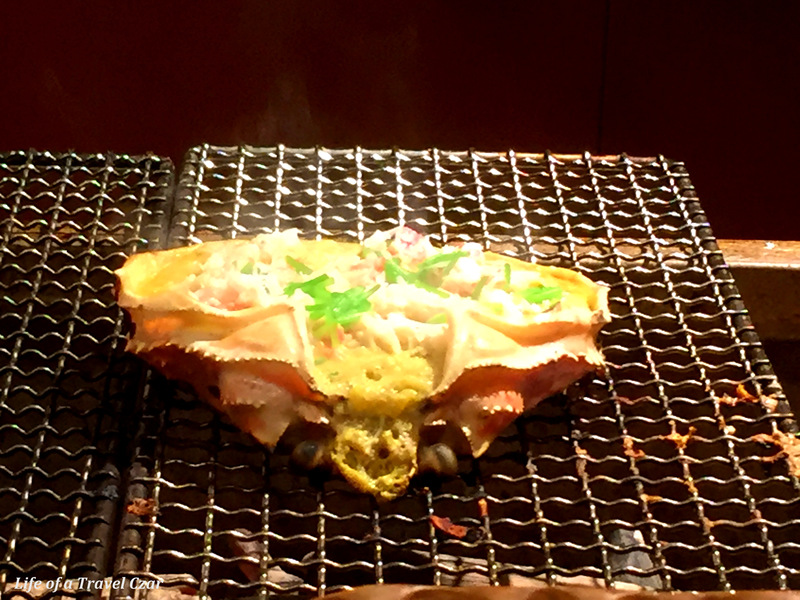 It is served in an abalone shell and there are a variety of tasters to whet the appetite. 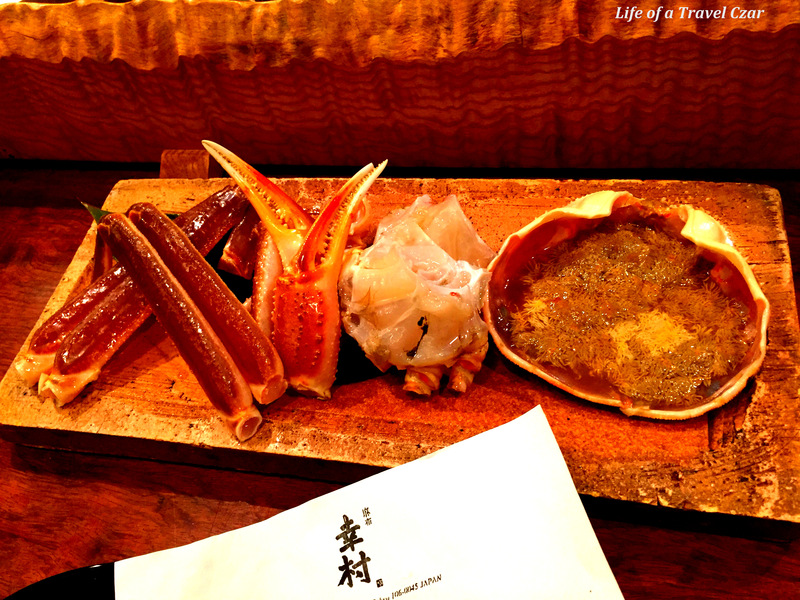 There are three different types of roe (Dried Mullet, Herring and Cod), a selection of root vegetables, abalone, a minnow fish and some black soy beans. The roes are rich and salty with a strong impressive flavour. The dried mullet roe unleashes a particularly lengthy flavour which lingers on the palate. The grainy texture of the roe makes it a delight on the mouth. 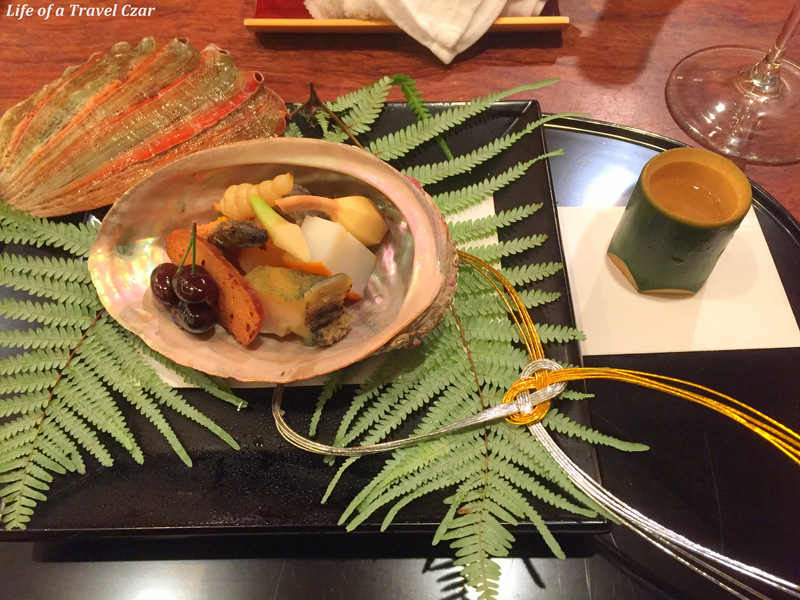 The abalone with its chewy texture proves a truly amazing delight to eat while the minnow fish is flavoursome but can’t compete with the roe and abalone on strength of flavour. The root vegetables and soy beans prove lovely palate cleansers. The custard has a lovely creamy sensuous texture but the flavour of the sea urchin is just missing in action. I was certainly waiting for it with anticipation but alas it never arrived. The arrowhead chips were crisp and offered a good texture contrast to the custard. This is one of the highlights. 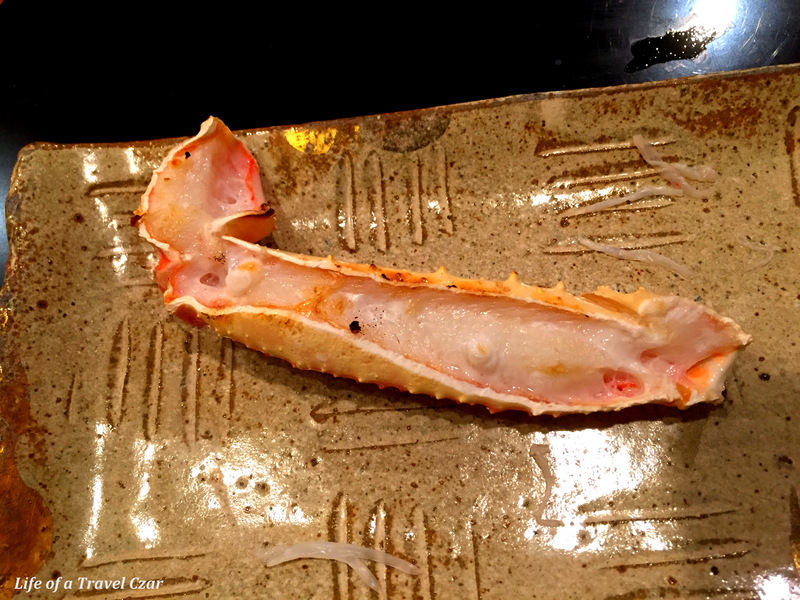 The crab is silky, soft and reflective of its full natural flavours, the dish could not put a foot wrong. The roe is rich with a deep flavour and combines beautifully to reinforce the natural flavours of crab. It is a signature taste experience and I savour every bite. I slouch on the counter feeling oh so satisfied. 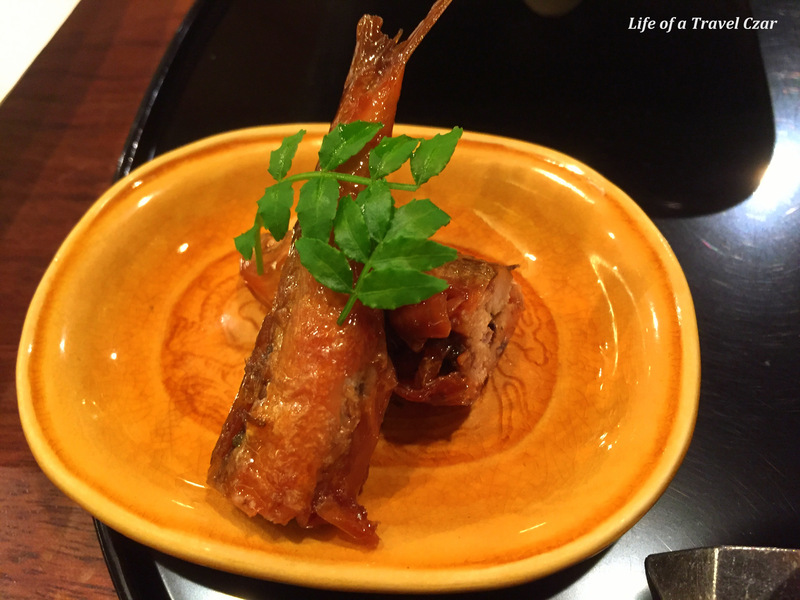 Next we have a small dish, the Moroko Minnow from Biwa Lake. The fish has a lovely pleasant smoky flavour with a flavoursome skin and a clean fresh tasting flesh proves an enjoyable experience. 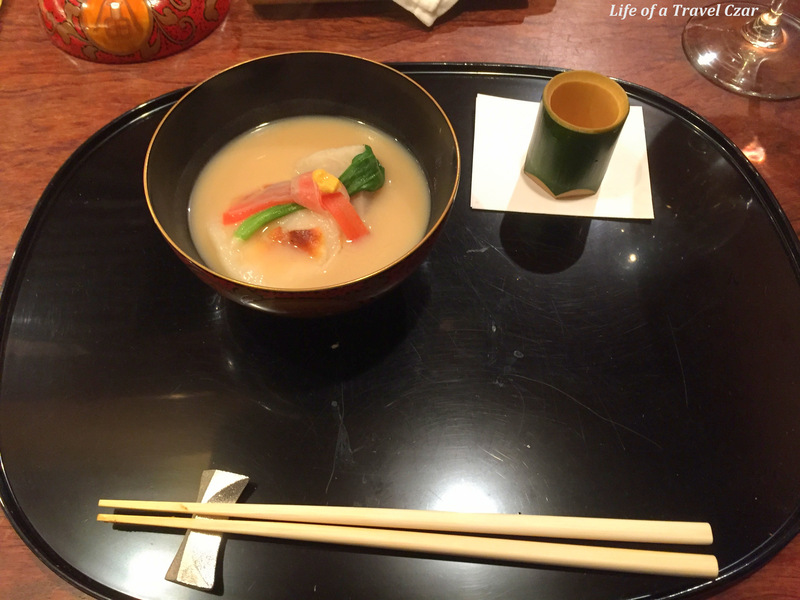 Next we have the White Miso Soup (Mochi, Japanese Radish and Carrot). 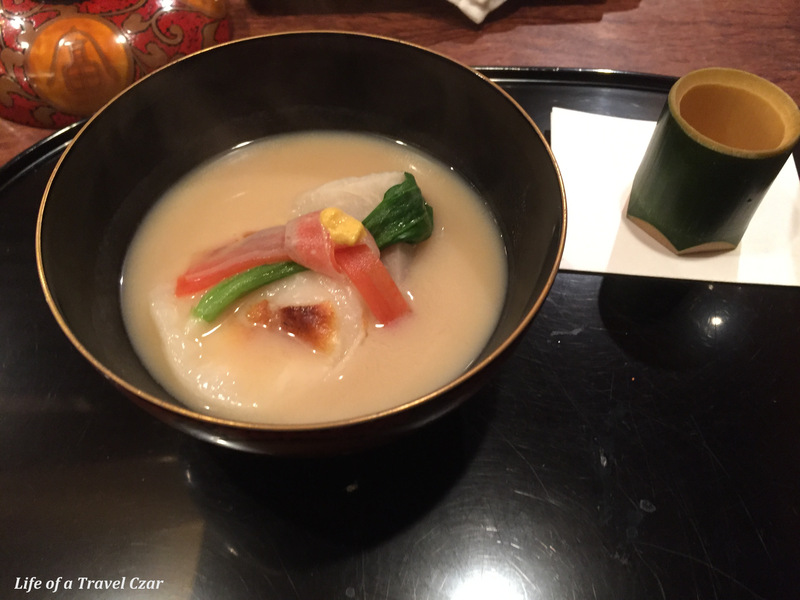 The mochi is a rice dumpling of some sort which is really chewy, the soft root vegetables are a delight to eat and the calm, subtle and gentle flavours of miso prove oh so delightful. A nice interlude as we make our way to the Main Course. 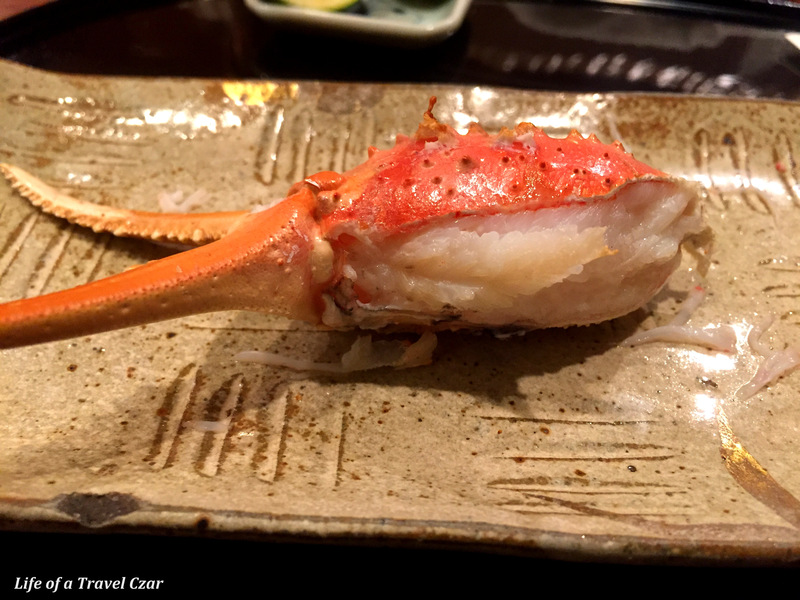 The main course is the Snow Crab from Taiza Port In Kyoto. This is a truly rare tasting experience. 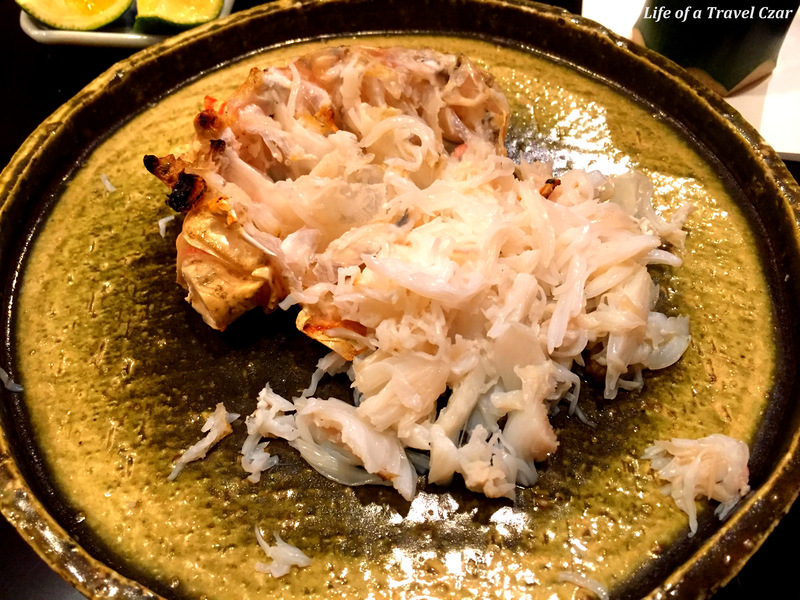 The Taiza-gani (as it is known) is considered the best (and most expensive) snow crab in the world because of its rarity, the exceptional quality and taste. 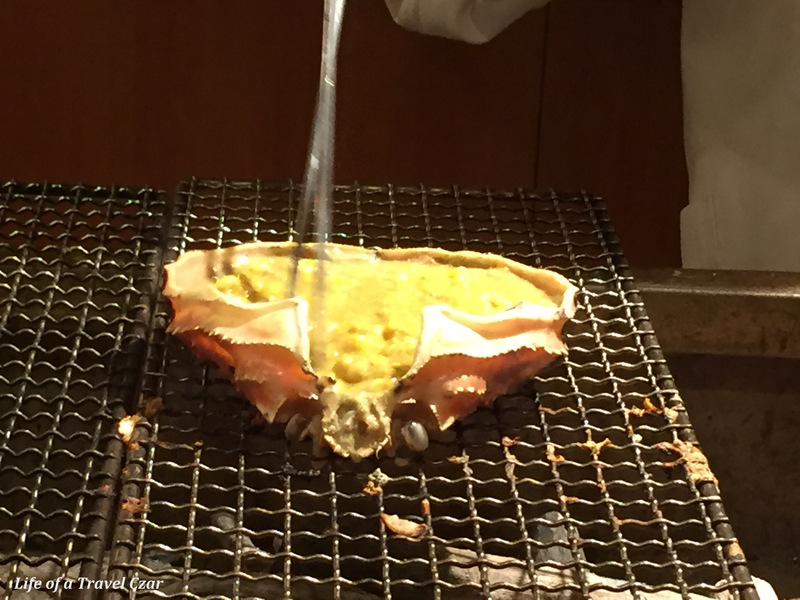 In a similar fashion of appellation DOC in Europe, only the crabs unloaded at a small port of “Taiza” in Northern Kyoto are allowed to be named “Taiza-gani”. The hostile weather conditions and the use of only a small number of registered boats makes this crab difficult to catch and volumes are very limited. 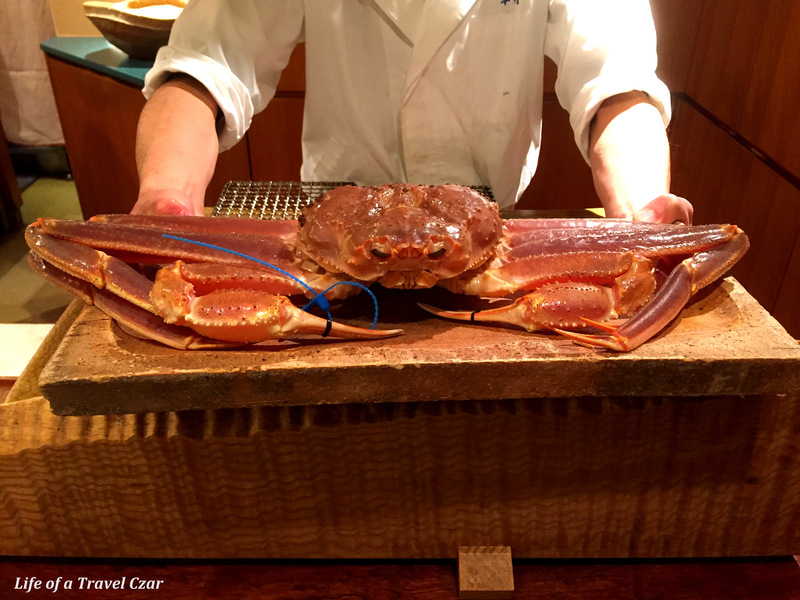 It is arguably the best crab in the world and sought after by connoisseurs who travel far and wide in search of experiencing it. The flesh of the Taiza-gani is super silky, sweet and full of the natural flavours of the crab with the saline aftertaste of the sea. 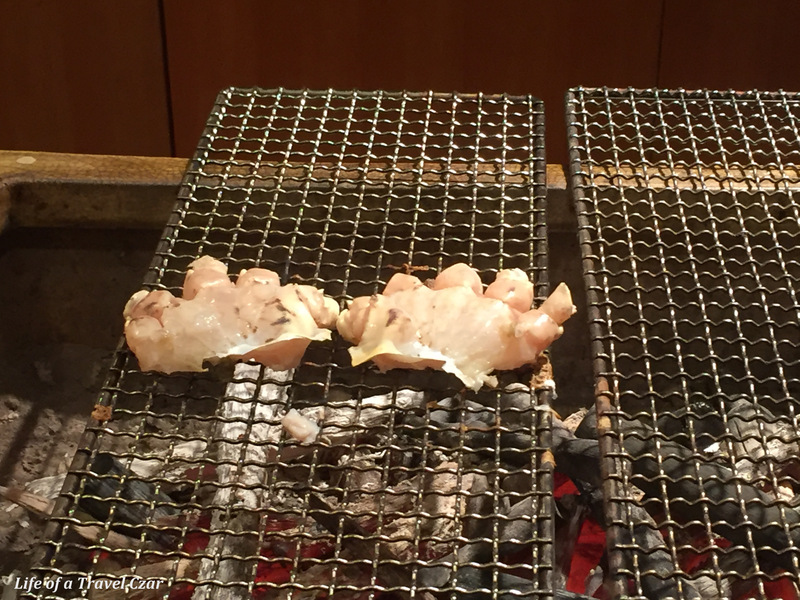 A pure delight indeed…it is a truly amazing experience to taste seafood at this standard. 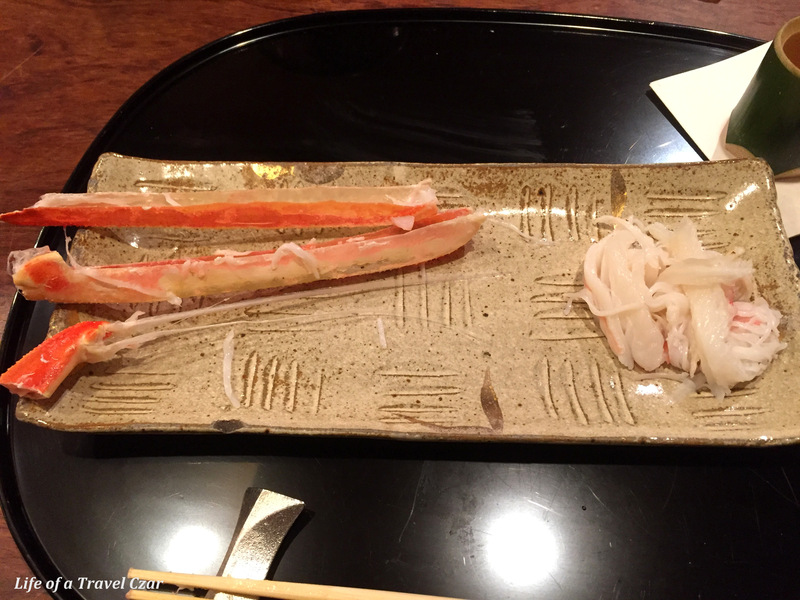 Each piece of flakey crab meat just melts in your mouth and sends a little tingle down your spine. There are moments when you are so glad that your are sitting down during this taste experience as your knees will buckle as each mouthful hits the taste buds. 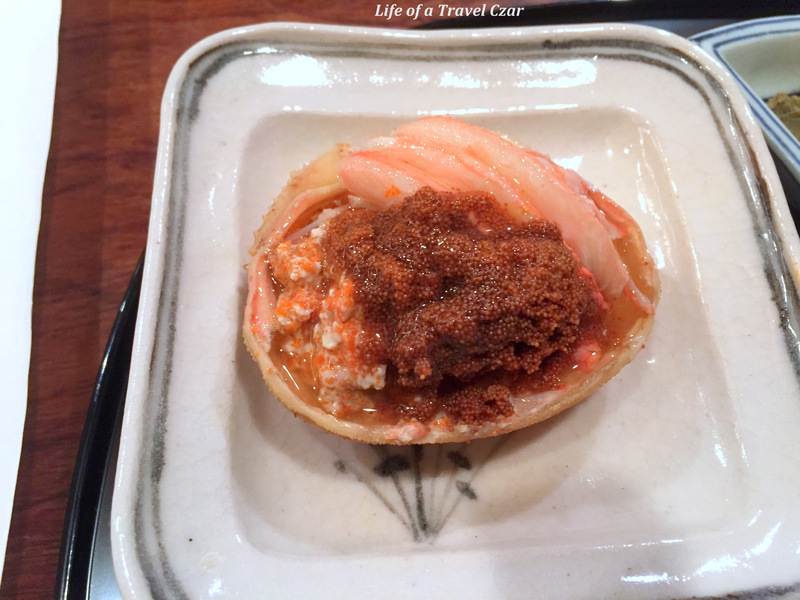 To finish off the Main Course, the innards (tomalley) of the crab in the shell are cooked with a saffron rice with additional crab meat. 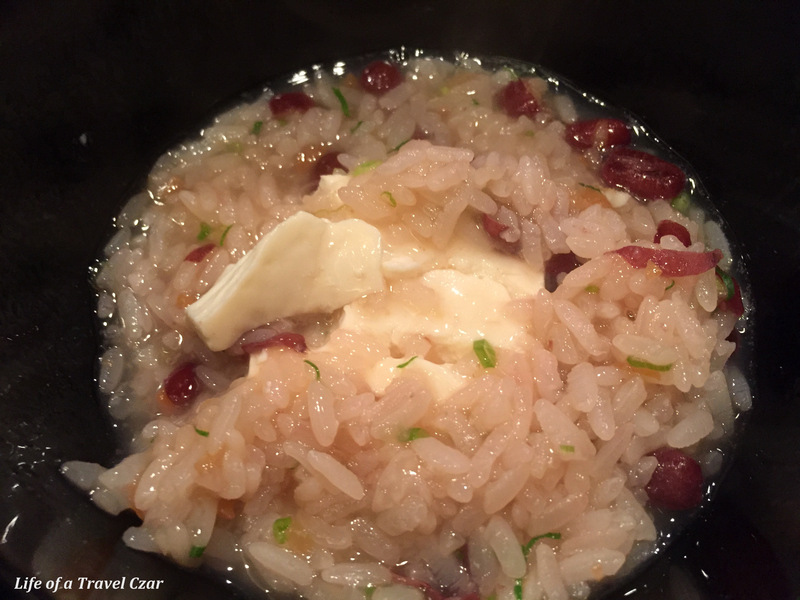 The shell is covered to allow the rice to cook before serving. 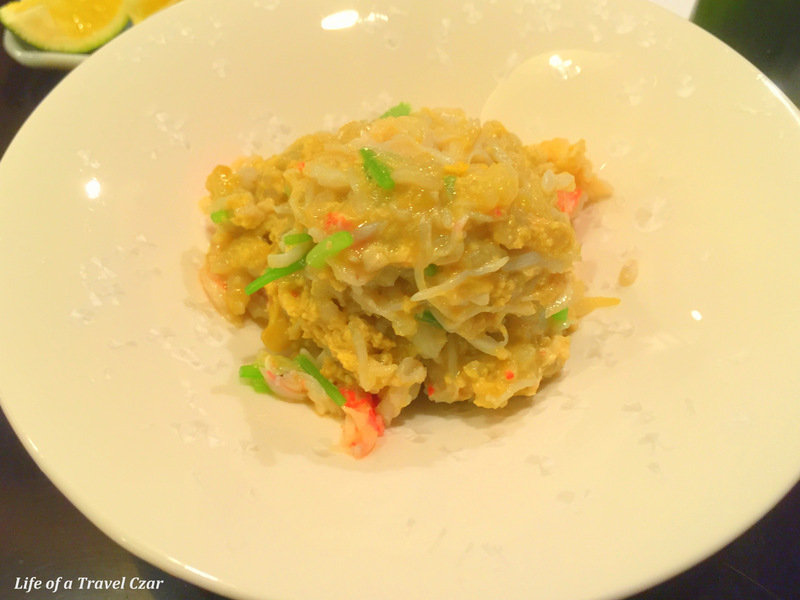 The dish is a velvety sensuous delight as the rice infuses with the tomalley, and the crab to deliver a soft well integrated taste experience oozing with the natural flavours of the crab which are extenuated through the tomalley. It is a dish defined by its richness and flavour. It is moment where time stands still for a moment and you need to gather yourself before continuing with the rest of the menu. 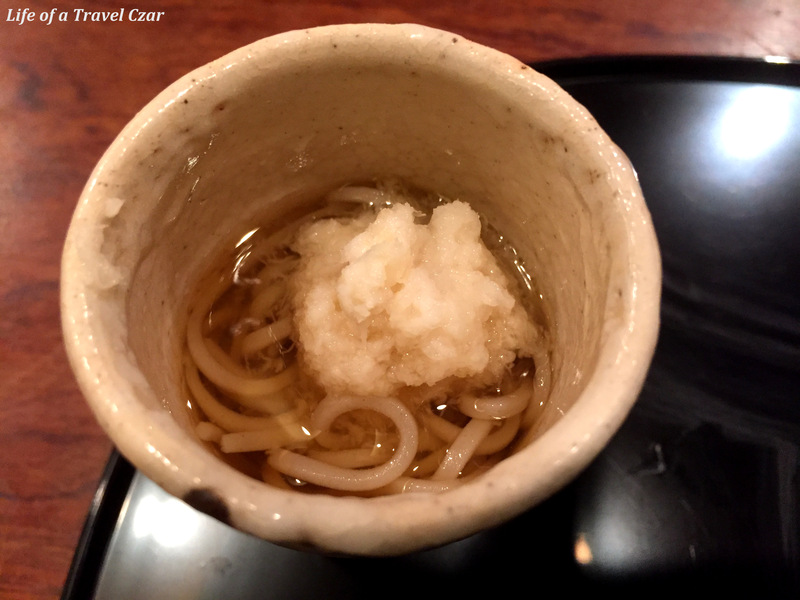 The soft slimy noodles race down your mouth at lightning aided by the salty broth only to have the sharp bite of the radish to halt your taste buds with a sting you wont forget. A nice way to cleanse the taste buds and deliver an umami hit. 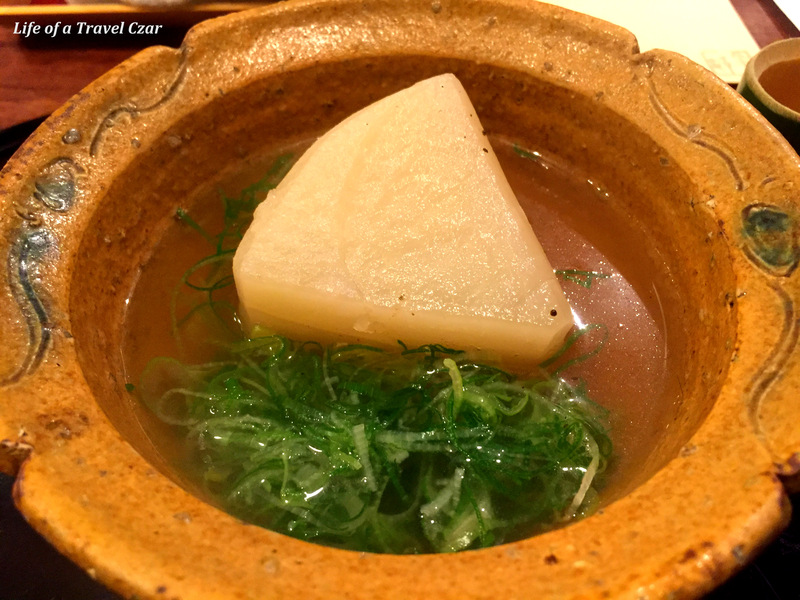 The Japanese radish has a translucent glow as it absorbs some of the broth to make for a melt in your mouth dining experience. It is not particular strong flavoured with most of the bite coming from the spring onion. It is simple but I don’t find it overly appealing. The dish has a sour taste, has the textural softness of the sweet curd combined with the glutinous nature of rice which is extremely sticky. Then the tang of pickled ume cleanses the palate before dessert. 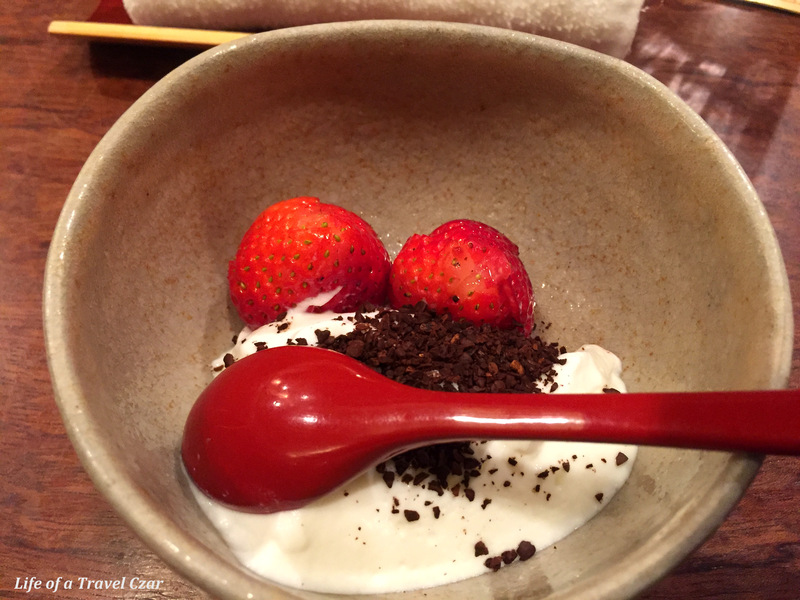 I was a bit disappointed with dessert, for a three star Michelin restaurant, a dollop of cream, crushed coffee beans and strawberries probably isn’t quite the standard it should be. I would say there is an allure of mystique and exclusivity of this place, given the non-descript entrance, the fact there is only 14 seats a night and the background of the chef. 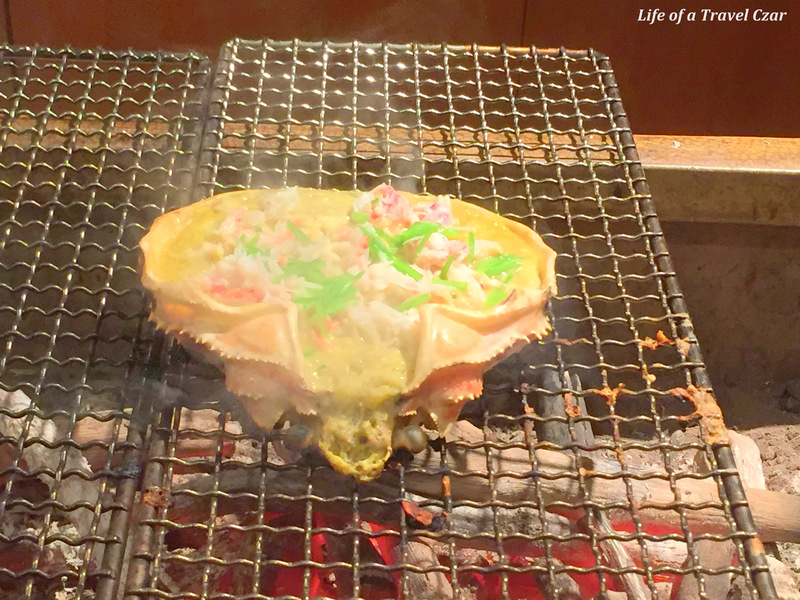 The Crab was amazing and one of those “you had to do it” dining experiences which one could never forget and the first dish of abalone and roe was a connoisseurs delight indeed. However there was simplicity and a lack creativity with the latter dishes or maybe it was the fact that the crab was the centre piece and everything else paled into insignificance. It was an enjoyable experience but I left feeling like a little improvement to the dessert and some other dishes could have lifted the standard.